Dark green velvet covers this gently curved update on the modern tuxedo sofa with horizontal channel tufting and three plush pillows. 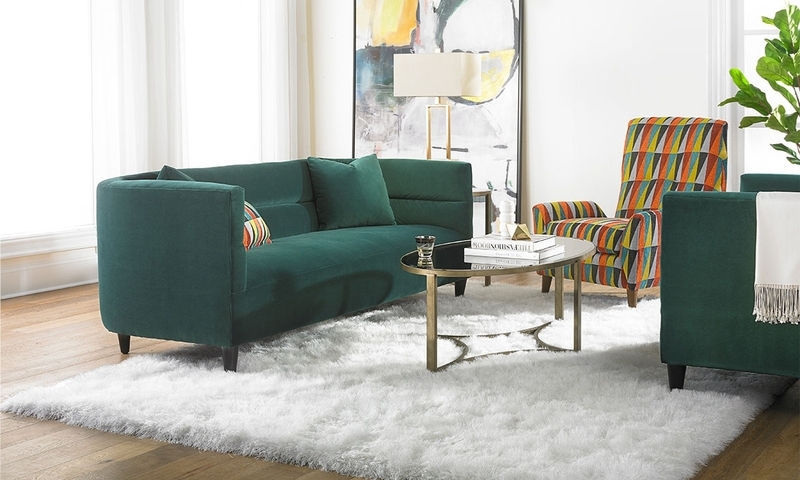 Make a statement in your living room with the Aldridge estate sofa from the Velvetique collection. This modern piece offers an eye-catching take on the tuxedo sofa with its gently curved silhouette hand-tailored in lush velvet. Made in America, it features a hardwood frame with classic tapered legs and deep bench seating. Horizontal channel tufting adds sophisticated detail to its simple design, softened by three plush accent pillows. Special order sofa available in a variety of colors, including the dark teal green shown here. See store for more details.